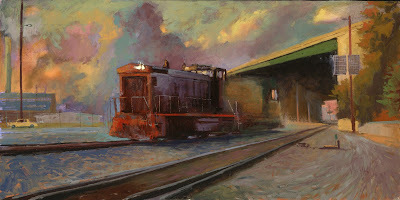 William Wray: Red Train revised and Come to the Show! Red Train revised and Come to the Show! Here is a painting some of you might recognize at first, but look closer as it's been heavily revised for my show on the 22nd. I was never happy with it when it went out (I considered it unfinished) and am glad it didn't go at the time. Now it will be in the front window of the show. I'll post both versions for your edification and if you want to read about the area it was from please look up the old post in the archives. 24x48 oil on wood. Here is another revised painting LA River 8x10 oil on linen-- I don't know if it's any better than the old one, but I think is has more warmth and texture. On another note: I've been a loser patron member of the California art club for some years now and haven't been able to get into President Peter Adam's inner circle Artist Member level. That qualifies you to be in art shows like the Gold Medal Show with the heavy hitters and pay larger dues. They have a membership cap on the artist level so only once every few years to the doors crack open for a few to scoot in. To bad about the membership cap, there are quite a few really talented artists who should have been invited in years ago, but felt ignored so they gave up trying. A shame as I think the club is a little weaker for it. Some are even starting competing clubs because they feel left out. I'm glad I made it this time, I was ready to crack myself. Good perspective and mood. It makes me recall of Alexander Petrov's artwork. GODDAMN, that's incredible! Great, great, work SIR! These are a couple of beauties. The new red train is an improvement. The contrast is much more pronounced, better colors and even the cloud shapes in the background are more appealing. Great rework! Best of luck on the show. Wish I could go to it! Will it be online, by chance? Tremendous work - the train painting has really benefitted from the extra time on it! Really great stuff! I love your work and look forward to meeting you at the show. 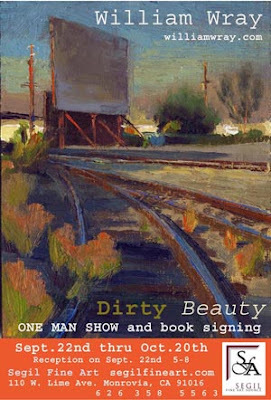 I just had the opening of my own solo show last night and we had a terrific turnout and great sales. I wish the same for you. See you then. Man, that revised Red Train is some of your finest work you've put up so far. Isn't it amazing sometimes what a few minor tweaks can do? Awesome. 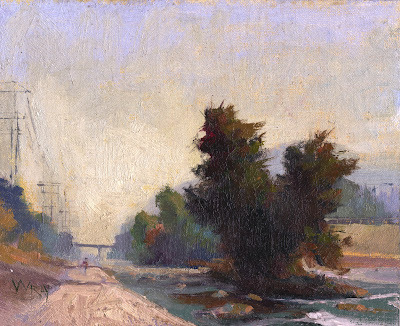 LA River, Great mood and I like the way you compose with value, like NC Wyeth. Great color! Thanks WK I can't believe how fast it's comming up. Fabian, thanks Russians are my favorite painters. thanks thor--snazzy shirts your doing. Both paintings have incredible strength,drama and contrast. Amazing! Beautiful painting, just friggin awesome! Do you mind sharing, what type of palette you enjoy working with, if there is one? Do you just paint by gut feeling, or set up a specific palette to help maintain harmony? I can't get enough! Love the red train whichever way; they both have a really nice feel to them. As always it is such a pleasure to come in here and view your work. I hope you're proud of this train painting, because you did a helluva job on it. I like the mashed-potato clouds with all their setting-sun colors, and I love how the shadows go over the red on the train. pumml, yes visit the Segil Galleries Web site next week fo rthe work online. thanks Tim it went up in the Gallery main window today-- an unreal feeling. your too good of a painter for those clubs. imo. what do they do at those meetings or whatever anyway? great stuff as usual. I like the revisions. Going to be a great show. I wish it was not such a long drive or I would be there to meet you, WK and the other CA painters. Great re-do of the Red Train. The sky is spectacular. I need the courage to try re-working some of mine. Hey Bill thanks for making ordering easier for us Luddites. Looking forward to perusing the pages. See you Saturday with the Mrs! Best of luck, amigo! Those are amazing. You're better than ever. your work is awesome. Thanks for all your support, I am having a blast with the blog and all the great artists I have met. These look fantastic! Sorry I can't make it to your opening, but I'll definitely see the show next week. I did put a link to this post on my blog so others can hopefully go see the show too. I went to your show tonight. It was wonderful to see you and your paintings in person. They're so beautiful I could look at them all night. Thank you! Mmmmm, I love the sky. Really sets off the train beautifully. I'm way behind on all my answers, can I give you all a group thank you? An extra tahnks to all those who showed up! Well, this is the first time I have blogged...had to sign up with Google...hope I don't get a lot of googlespam. But we bought your painting Stairway to Heaven,and it now hangs on a wall in our house overlooking the Deschutes River in Oregon. It is absolutely wonderful. Your work is inspiring my work, and while I am not copying your work, I am using your book as reference as I work out my attempt to paint the vanishing rural Oregon. Two days ago I set out early to get the first light on a weird trailer/house construction several miles from my house. the darn thing was torn down (or removed...but I doubt that...it should have folded)...and a huge for sale sign in its place. So many parts of this rural high desert have been condoized or have become parts of gaited communities, I know I will have to travel far afield for scrap...and/or plein air. Do let me know when you are teaching a course. William, why haven't you painted the trucks upon which the old SP SW1500 switcher sits? I've noticed that you don't paint the wheels or side frames of the locomotives that you paint, why? The trucks are some of the most complex steel castings on a locomotive, it should be relished as a painting challenge worthy of an artist of you astonishing talent!